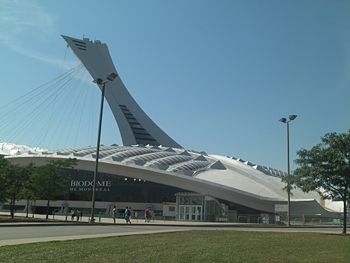 The Montreal Biodome was originally built as a velodrome. Today it is home to many different species inhabiting four distinct artificial environments. Not to be confused with the Montreal Biosphere. The Montreal Biodome (French: Biodôme de Montréal) in Quebec, Canada is a public facility housing four distinct artificial ecosystems - marine, polar, tropical and Laurentian forest - which allow visitors to observe many different species of the Americas. The site was formerly a velodrome built for the 1976 Summer Olympics. This page was last modified 07:48, 10 October 2010.